Pick the beans clean from stones and grit and soak them in cold water overnight. Drain and rinse them in a colander, put into a large saucepan or a pressure cooker, cover with plenty of cold water and boil them until they are cooked but still a little hard. 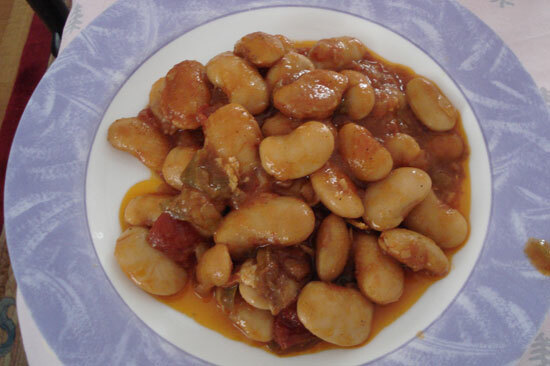 This type of bean cooks quickly, so be aware until you get used to them. They take hardly 2 minutes in a pressure cooker and about 30-40 minutes otherwise. If they get overcooked, they get mushy and soggy and they do not taste at their best. This first step then is also the most important in this recipe. Drain the beans through a colander and keep aside. In the same saucepan, heat the olive oil and fry the onions, the garlic and the dried herbs, until they start turning pale golden. Add the tomatoes with all the juice from the cans or, if fresh tomatoes are used, add 150 ml water. Then add the tomato puree and sugar, break up the mixture with a fork, season with salt and pepper, cover and cook for 30 minutes or until the sauce thickens. Mix the parsley into the tomato sauce, add the beans and mix well. 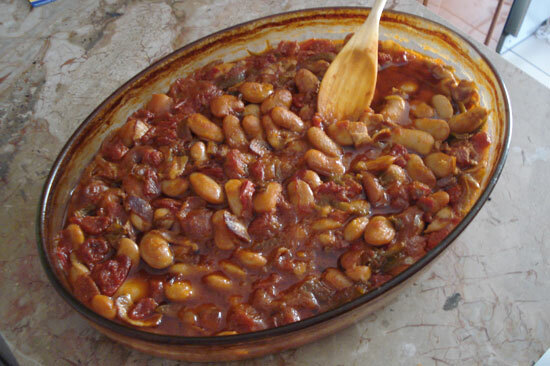 Spread the beans in an oven dish. Sprinkle a little oregano and black pepper on the top and cook in a pre-heated oven at 350 grades F / 80 grades C, for 30 minutes, without stirring, until they look slightly crisp on top and quite dry. Alternatively, add the beans to the tomato sauce, mix well, cover and simmer for 10-15 minutes.